Pioneers in the industry, we offer pallet conveyors and lowerator /elevator from India. The pallet conveyors are mainly used to transport, manufacturing unit accumulation & assembly point in the home appliances, automobile industry, electronics & electrical process. These are available with product carrying platform in various sizes with standalone or integrated system available as single track or twin track depending on the production requirements. 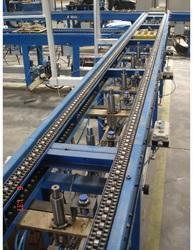 A pallet conveyor can handle a variety of products, from small electronic items to huge automotive bearing units. This provides continuous production flows for product routing, balancing & positioning to meet system integration network demand. This device becomes essential for elevating or lowering a variety of containers, Bags, Pallets, Drums and other products when space is a concern. It can handle various types of material without any changes in structure & carrying platform. Convey the material in both directions i.e. upward & downward with auto discharge due to a folding platform which will push the material to discharge end with roller conveyor. A sensor will be provided to detect the jam at discharge point which will stop the motor automatically. Side wire mesh will protect any operation hazard during operation safety. Optimise electrical consumption. Available in MS, SS constructions. Due to custom-made design, it will fulfill the customers' requirement. Applicable in any industries for material handling, logistics or day to day activities.